An article on openculture.com - 40,000-Year-Old Symbols Found in Caves Worldwide May Be the Earliest Written Language - reports on research being carried out on Ice Age symbols and the possible link to a proto-writing system. Painted symbols in Niaux cave, France. Archaeological evidence points to the earliest writing systems developed by the Sumerians at roughly 3400 B.C.E. However, new research is asking whether the earliest writing systems predate 5000-year-old cuneiform tablets by several thousand years. Indeed, Paleoanthropologist Genevieve von Petzinger is asking if these prehistoric marks represent universal symbols. The study of symbols carved and painted in caves all over the world including penniforms (feather shapes), claviforms (key shapes), and hand stencils could eventually persuade archaeologists to look back beyond the Sumerians. While going deep underground to make cave paintings of animals, early humans as far back as 40,000 years ago also developed a system of signs that is remarkably consistent across and between continents. Von Petzinger has spent years cataloguing these symbols (many already documented) in Europe, visiting 52 caves in France, Spain, Italy and Portugal. The symbols range from dots, lines, triangles, squares and zigzags to more complex forms like ladder shapes, known as tectiforms. She discovered 32 signs found all over the continent, carved and painted - consistently - over a very long period of time. von Petzinger sees this system as a carryover from modern humans' migration into Europe from Africa. 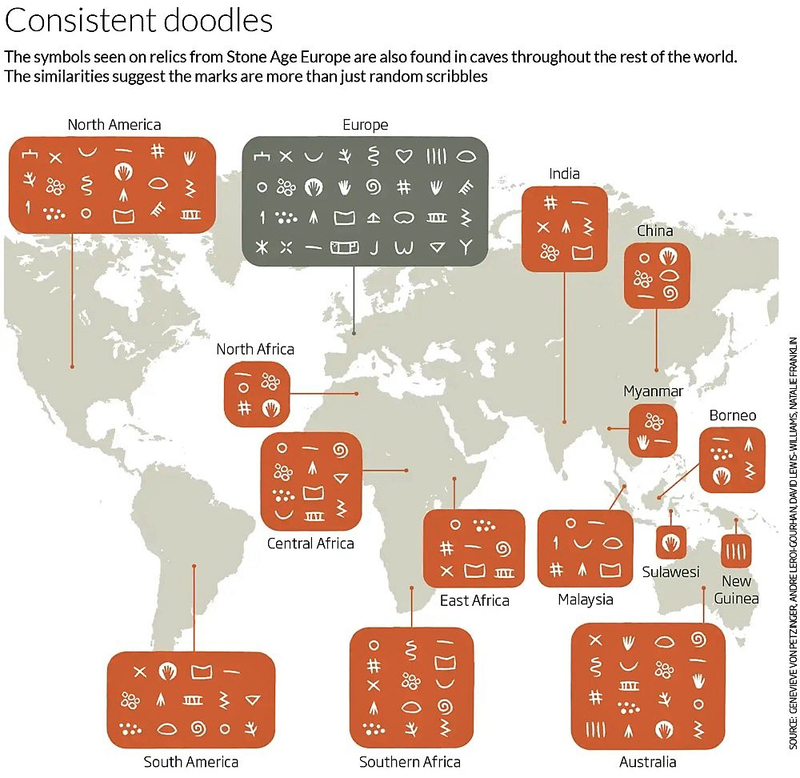 "This does not look like the start-up phase of a brand-new invention," she writes in her book The First Signs: Unlocking the mysteries of the world's oldest symbols. von Petzinger describes this early system of communication through abstract signs as a precursor to the "global network of information exchange" in the modern world. "We've been building on the mental achievements of those who came before us for so long," she says, "that it's easy to forget that certain abilities haven't already existed," long before the formal written records we recognize. These symbols traveled: they aren't only found in caves, but also etched into deer teeth strung together in an ancient necklace. Von Petzinger believes this use of abstract symbols to communicate is a fundamental shift in our ancestor's mental skills. It's complicated: when it comes to the European symbols, prehistorian Jean Clottes argues "the signs in the caves are always (or nearly always) associated with animal figures and thus cannot be said to be the first steps toward symbolism." Conversely, MIT linguist Cora Lesure and her co-authors in a paper published in Frontiers in Psychology last year, suggest that both the signs and the animals were meant to convey ideas just as a written language does. Cognitive mechanisms necessary for the development of cave and rock art are likely to be analogous to those employed in the expression of the symbolic thinking required for language.